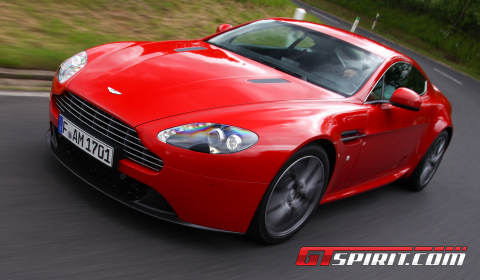 The brand new Aston Martin V8 Vantage Facelift has finally arrived in the hands of our test driver. 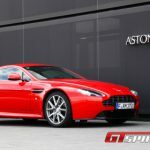 The latest version of the V8 Vantage is still a no-excuses two-seater sports car, the entry-level model in the Aston Martin line up. Like its non-facelift predecessor, it is beautifully built, performs brilliantly and while the interior ergonomics aren’t perfect, they’re not that bad either. Placed in front of the Aston Martin test centre located adjacent to the famous Nurburgring circuit, a red V8 Facelift Coupe was awaiting our arrival. 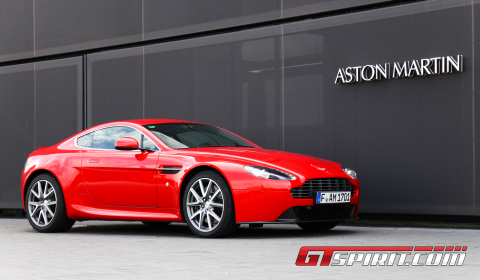 Ready to be tested and reviewed alongside its powerful sister, the V12 Vantage. 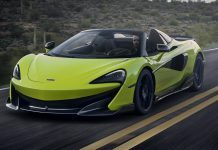 Our day could not start any better than this knowing that our destination would be the autobahn and country roads near the Nurburgring Nordschleife, commonly referred to as the Green Hell. 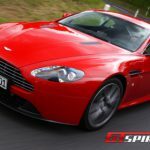 Aston Martin’s entry-level model adopts some of the cosmetic and hardware upgrades first seen in the Vantage S. One of these many upgrades is the seven-speed Sportshift II, which comes standard in the Vantage S. It replaces the optional six-speed Sportshift automated manual transmission while the standard six-speed manual transmission remains. Our test model was fitted with this manual gearbox, which was linked to the 4.7 liter V8 engine producing up to 426hp at 7,300rpm and 470Nm of torque at 5,000rpm. A sufficient amount of power, which is converted to the rear wheels, while you swiftly make your way through the six different gears. 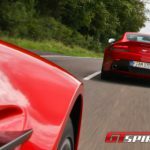 Zero to 100km/h sprints are done in a mere 4.9 seconds, while the top speed is 290km/h. Other technical highlights include bigger front brakes with four-pot calipers, an improved steering response and 10mm wider tires. For those interested, a lower front splitter, beefier side sills, bigger rear diffuser and a new alloy wheel design complete the minor styling tweaks on the outside. 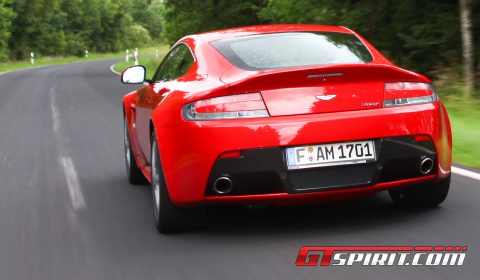 In essence the Facelift did not change much to the setup of the V8 Vantage. The changes to the chassis and the brakes are all taken from the Vantage S and provide upgrades requested from a facelift. The 380mm front discs with six-piston calipers provide improved braking while the 10mm wider tires account for a better steering feel and handling. 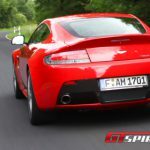 Although some improvements were introduced, the steering and handling of the V8 Vantage are still not up to the level offered by competitors like Audi and Porsche, nor does the V8 provide the level of ultimate sporty refinement found inside a 911 or an Audi R8. 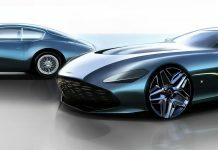 But Aston Martin’s are nothing like the ultimate sports car nor a mix of exotic flare and rock solid performance, they are more like a world-class sophisticated product that puts the Great into Britain. 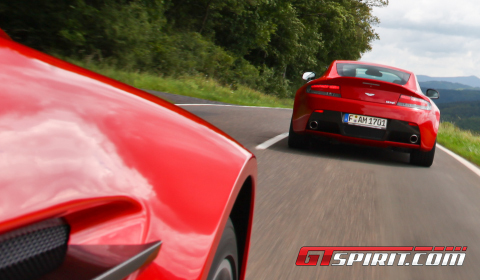 The V8 Vantage Coupe Facelift is still the same comfortable gentleman’s sports car offering sheer driving pleasure fueled by an astonishing soundtrack. The passengers will admire the wonderful combination between agility on smaller country roads and the available performance on stretches of autobahn. And yes, it still has all its minors and ergonomical failures inside the interior, but the Vantage’s presence, looks and sound track make up for any of those shortcomings.